Dental Assistant Graduation - Do You Have The Right Stuff? 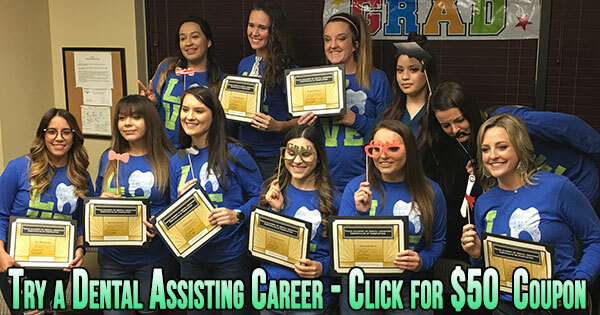 It was dental assistant graduation time here at Texas Academy of Dental Assisting for our most recent class. We are so proud of each and every student, so Congratulations to you all ! We want to give a huge shout out to graduate student Brianna T. Brianna was looking for a change from the retail life of a local department store and had the desire to pursue dental assisting. Our hats are off in celebration for Brianna for she is now working as an RDA-registered dental assistant. Texas Academy of Dental Assisting is honored to share the excitement with graduate student Karen D. Karen came to us while working as a medical assistant/receptionist and once she graduated she was hired as an RDA for general dentistry. Congratulations Karen! We want to acknowledge graduate student Emily M. Emily was working for a day care while attending Texas Academy’s 12 week dental assisting program. Once she graduated she latched on to an RDA position in general dentistry and we are so delighted for her. Congratulations Emily! Are you ready for a life changing career? If so then don’t wait…Email or call us at (817) 291-8078 today!